Vacationing with your fur-baby in St Augustine, Fl can be one of the most enriching experiences of your life. After all, you adopted your companion to accompany you day-in and day-out through life’s adventures. A long-distance escapade should not be the exception. However, finding the right environment in which to share your St Augustine vacation with your pet can be challenging. Most notably finding a vacation destination that is also pet friendly. 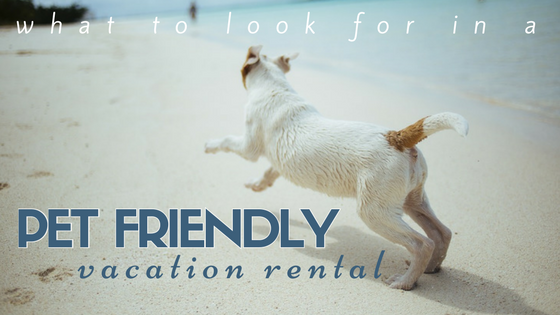 We’ve put together a few things to look for while shopping for a pet-friendly vacation rental. Check those restrictions: When booking your reservations, be sure to ask questions. First and foremost, are they pet friendly? Are there size or breed restrictions? Is there an animal limit for those families with more than one fur baby? Disclose the details about your furry family member. Trying to misrepresent or hide information from the property will only result in a very stressful vacation, which defeats the whole purpose of your trip. Ask about fees. Are pet deposits required? Are the fees non-refundable? Will the property require proof of vaccinations? Be sure to have proof of current rabies vaccinations, as well as a current health certificate with you. Be sure to consult your veterinarian to ensure all vaccinations are up-to-date and acquire a current health certificate (usually within ten days of your travel plans). The better prepared you are, the easier your stay will be. Is a ground-floor unit available? Ground floor units are easiest for your pet. They’re already dealing with being in a new environment. Avoiding stairs or elevators will only benefit their comfort, as well as yours. However there are exceptions. Some of us pet owners have very spunky pets that need to run out as much energy as possible, therefore steps might be better option. No matter which floor you stay on, always be sure to respect the grounds around the property and use the designated areas for pets to enjoy. If you are not sure which areas are designated please ask the front desk. The designated walk area for pets at Beachers Lodge is behind the conference room next to the office. Is a pet park available on the grounds? The ability to take your pet outside for multiple walks each day will relieve quite a bit of your pet’s anxiety. Pent up energy from an anxious pet can be disastrous in a new environment. Be sure to bring your pet’s favorite toys, pet bed, and perhaps even a sheet that smells like home to offer comfort and reassurance that everything is okay. Pets fear abandonment above all else. Providing familiar items from home will bring them comfort. Are pet waste stations available on the property? Staying in a vacation rental requires owners to keep their critters leashed and to clean up after their pets. This shows an appreciation and understanding to both pet-owners and non-owners alike. Respecting the property’s environment is imperative to an enjoyable vacation experience for everyone who visits. Can the property recommend nearby pet-friendly establishments? There are websites, such as BringFido.com andDogFriendly.com , however, having that local recommendation is always a huge help. Can the owners recommend a local dog-walker or pet-sitter? Try checking out PetSittingDirectory.com or the app Wags for local dog walkers. However, if the property’s staff can recommend someone, or better yet, they have a staff member offering these services, you’ll feel reassured that your four-legged friend is receiving the best possible care in your absence. You love your animals. You love going on vacation. You should have the best of both worlds when you visit us in St Augustine. Contact us today and ask about our pet-friendly policies. We’d love to confirm your reservation, so you can focus on all the fun activities you and your fur-baby will be doing while staying with us!